a.All the Aluminum panels are prefabricated according to customer’s designs and drawings, ready for installation. b. With customized designs and fabrications, the Aluminum panels are easily mounted and match the design of building very well. c.With various customized shapes and structures, the Aluminum panels can help to realize the architect’s special ideas and concepts, giving more styles and designs for the buildings. d.The Aluminum panels are fixed to the frame which is extended from the main structure of building but separate from the main structure to be an independent curtain wall system, they don’t give extra weight to the building, this system can also give good thermal insulation and sound insulation to the building. 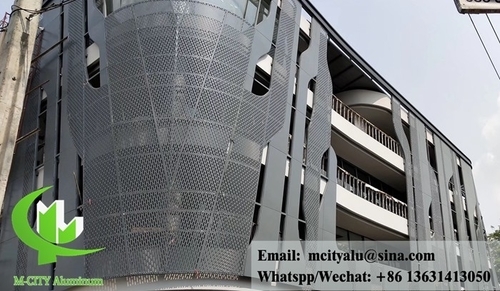 e. As the Aluminum panels are fixed in separate system, it is very easy to maintain the building and replace any damaged panel, and it is also very easy for innovation when the building looks old and needs to be refreshed. f. The Aluminum panels are very light and prefabricated, so you can quickly install them and finish the building easily. g. With PVDF coating, the Aluminum panels are very well weather-resistant, corrosion-resistant and discoloration-resistant. This helps the building to stay durable color and clean look. h. The Aluminum panels are fixed with anchor bolts in strong system, this gives the building with very good impact strength and anti-shock of earthquake.